Westby House Inn offers a delicious alternative to other Westby, WI, restaurants with our seasonal tearoom and restaurant. 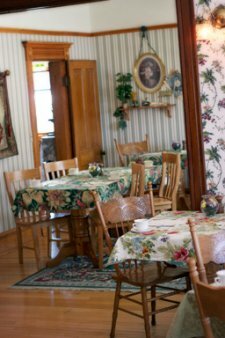 Experience a delectable lunch or a comforting cup of tea in one of the best Westby, WI restaurants. Open seasonally to the public, our on-site restaurant serves some of the finest meals and baked goods in the region. Delight your palate with delicious local fare, immerse in the relaxing atmosphere, and enjoy unparalleled wait staff service. When you dine with us, it’s sure to be one of your favorite experiences during your Westby House stay. Each of our menu selections is made from only the highest-quality ingredients with a focus on simplicity and freshness. From house-made soups and salads, mouthwatering entrees, and fresh Cedar Crest Ice Cream for dessert, just one bite won’t suffice. Reservations are highly encouraged, so call today to reserve your table for an unforgettable meal. For even more Westby, WI restaurants, we recommend taking a look at the suggestions listed in our Free Wisconsin Vacation Guide. Considering a getaway? Welcome to our bed and breakfast in Wisconsin! We are the perfect alternative to other Wisconsin lodging options and provide 9 beautiful Westby, WI, accommodations. Visit us and experience the ultimate relaxing vacation. Known as one of the best Westby, WI, restaurants, our menu is complete with delicious and fresh entrees for all types of diners. Westby House Inn is one of the most unique places to eat in Westby, WI which features a lunch menu, tea room, and coffee and ice cream shop. Some of our most popular menu items include the delicious House Favorite Chicken Salad that offers fresh and tender diced chicken breast that is complemented by fresh fruits and vegetables, as well as our Westby House Reuben that is served with hot deli-style corned beef, sauerkraut, on dark rye. Also, indulge in our soup and salad deal that comes with our house-made soup and a large dinner salad and dinner roll. All of our entrees are guaranteed to get your mouth watering! Our Sandwich Board offers a Grilled Chicken BLT Sandwich, a Hot Meatloaf Sandwich featuring Westby Meats & More meatloaf, and the ever-popular Turkey, Cheddar Melt, plus a selection of Deli Sandwiches. Wines by the Glass or Bottle, local beers and cocktails are also found on our Beverage offerings. Fresh brewed coffee from Viroqua’s Kickapoo Coffee Roasters is our coffee feature. We can accommodate most diet needs or vegetarian requests with many of the other menu items- Inquire when dining. We advise you to call ahead for availability, as the restaurant does honor large parties that reserve the entire restaurant, therefore, may not be serving to the public. Entrees and Sandwiches from $6.95 to $10.95. House Favorite Chicken Salad – Our most Popular item! Made fresh daily, tender diced chicken breast complemented with apples, celery, and mayonnaise and crowned with cashews. Garnished with in-season fresh fruit. Served with a dinner roll. Westby House Reuben – Continues to be a house tradition! Hot deli-style corned beef with sauerkraut, Thousand Island dressing, and melted Swiss cheese on dark rye. Prepared as an open-faced sandwich. Accompanied with Potato Salad, Fresh Fruit, or Westby Creamery Cottage Cheese. Stuffed Broccoli and Cheese Chicken – Lightly breaded chicken breast. Oven baked. Served with a medley of vegetables and rice. Dinner Roll. Spend the afternoon with us with delicious fresh tea and finger foods in one of the best tea rooms in Wisconsin. Unlike other Westby, WI restaurants, our Tearoom offers exceptional attention to detail and ensures that your afternoon with us will be relaxing and decadent. Enjoy traditional English-style tea, a variety of gourmet tea sandwiches, scones, cakes, pastries, and more with a visit to our tearoom. Available mid-April through early October. Closed on major holidays and the Saturday before a holiday that falls on a Monday. Tier 1 – Three varieties of Gourmet Tea Sandwiches. Tier 2 – Scones with English Devonshire Cream and selection of cakes and pastries. Tea – Choose your favorite Tea from our extensive list. Served in china teapots. Please call 24-hours in advance to reserve your spot for Afternoon Tea at our exceptional Tearoom! Group Reservations are always welcomed; even in the off-season. We can accommodate bus tour groups of up to 55. Call 608-634-4112 for more details. Evening dining is not available at the Westby House Inn. For information on evening dining close to the Inn, please visit our page on the Westby Area. Our Specialty is Your Occasion! Reserve the formal dining room or the Entire House for that special occasion! Inquire about our banquet options and catering accommodations. We can cater your special occasion in one, or all three dining rooms. Minimum 25. Maximum 40. Ask us about hosting Christmas parties, office dinner meetings, rehearsal dinners, family reunion meals, baby showers, or bridal showers.